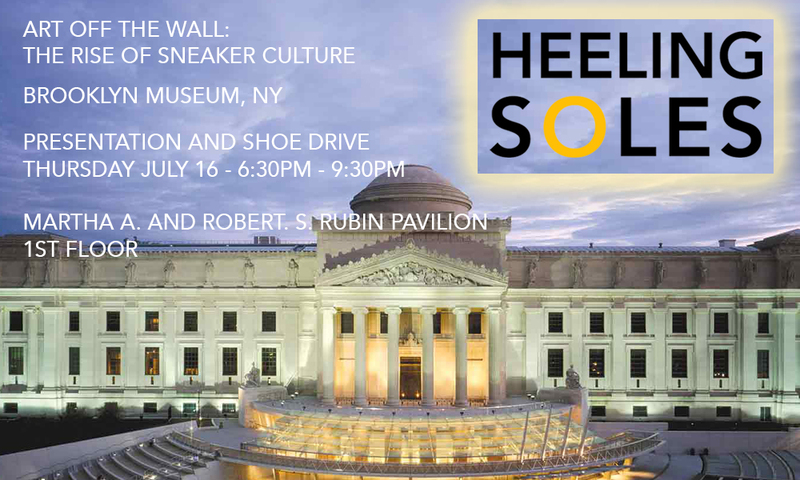 Next Thursday July 16th the Brooklyn Museum presents Art off the Wall as part of the Rise of Sneaker Culture, an amazing exhibition that includes approximately 150 pairs of sneakers, and looks at the evolution of the sneaker from its beginnings to its current role as status symbol and urban icon. And our amazing charity initiative Heeling Soles have been invited to give a presentation about their work and give folks an insight into how we have been helping people to Walk Towards Brighter Futures.We will also be having a shoe drive so please bring new or lightly used shoes that will be given to those in need. And yes let’s not forget the tunes, DJ Collective I Love Vinyl will be spinning a very special sneaker evolution set on the night. We are looking forward to what they did out of the crates. You will also be able to get an exclusive look at the extended trailer for Jordan Heads, an upcoming documentary about the iconic Jordan sneaker. This sneaker drive, hosted by Heeling Souls, will collect shoes to help people step up and out of poverty. Bring your gently worn items or new sneakers. Step into a conversation honoring women sneaker collectors, designers, and media makers hosted by Obsessive Sneaker Disorder’s Sean Williams. An all vinyl dance party inspired by the evolution of the sneaker, featuring classics from throughout the decades played by DJ collective I Love Vinyl.